2 FREE Month of Mobile Texting with QR CODE - $20mo thereafter. 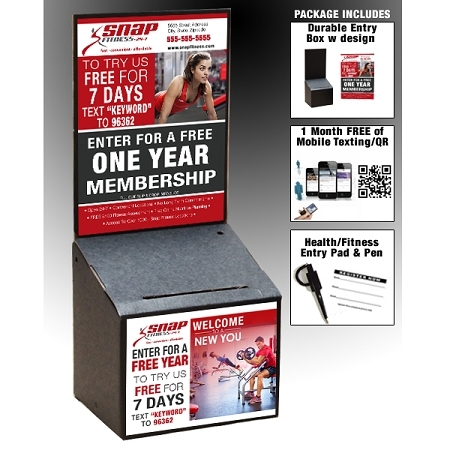 Multi Functioning Lead Box Lets your potential member have the option to fill out an entry form,take a guest pass, scan the QR code or Mobile Texting. Combine 4 different Marketing Strategies into 1. 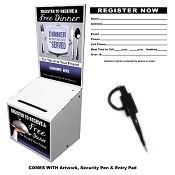 Your Contest Boxes or Guest Passes will display your "Promotion" along with your "QR CODE" & or "Short Code" and "Keyword." Example: To Receive A Special Bonus, text "11111" and enter keyword "SNAP" or "Scan QR Code to Receive A Special Bonus." The potential member now has an option to 1. Fill out entry slip. 2. Take a guest pass. 3. Text to you their interest. 4. Scan QR code and enter their information online.